Pristine Property Maintenance Services has an enviable reputation for reliable high quality work on cedar hedges, broadleaf hedges, and shrubs. 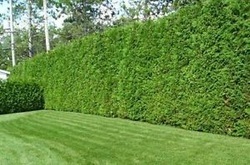 To maintain the cedar hedge with a formal, neat appearance, and with a complete cover of dense foliage, it is essential that shaping and trimming is started earlier on in the life of the hedge, and is then carried out regularly. Cedar hedges and bushes are excellent privacy screens, as they have very dense foliage. Unfortunately this is also one of their draw backs. The dense outer leaves cut off light, so the inside is devoid of leaves. This limits the amount of trimming that can be done. Cedars can grow about 3 to 6 inches a year in width. Regular shaping and trimming is needed to control this growth, and to keep the width of the hedge the same, but taking off more than 8 inches will expose the inside of the hedge. Cedar hedges can quickly become very tall, often causing too much shade , growing into utility lines or giving a crowded feel to a garden. Cedars can survive heavy reductions in height, and although reducing them more than 30% is not recommended, it can be done, within limits. Regular maintenance is a better option. Many cedars sustain damage during the winter from snow loads crushing the tops of the hedge. Old hedges are often thinner and taller and more prone to damage, which often results in long limbs being bent to the ground under the weight of snow. Repair and prevention work can be done on these cedars using particular non invasive tying techniques, staking the bushes to give them extra support, with appropriate trimming and fertilizing. We have the experience to work on the restoration and reshaping of even really badly neglected cedar hedges.